Yesterday I made another batch of ice-cream. The chocolate was fabulous, but I wanted some vanilla as well, and I still had seven free-range organic vegetarian eggs in the fridge. The vanilla ice-cream called for six eggs, which would leave one leftover, so I started separating yolks until I came across an egg that bounced back. Apparently some hens lay hardboiled eggs. I digress, this is not a post about ice-cream, this is a post about what to do with the leftover egg whites that come when you take away the yolks to make ice-cream: they sit in a measuring cup in the fridge and look lonely. Very lonely. Six is too many to make Mexican Chocolate Chewies, five pushed that limit to the brink, and I’m pretty sure six would’ve pushed it over the edge. So I did the only logical thing, I googled around the internet for a solution. There were not many to be found, until I came across Self-Frosting Angel Cake at the Cookie Baker Lynn blog: it used six egg whites, I had those. It used cake flour, I used to have some, but it went out with last weekend’s pantry purge (the box said it expired in 2008). I don’t use cake flour very often, but I am not one to be easily deterred. You can fake cake flour, and I had cornstarch on hand. Once I had the necessary faux cake flour, the recipe and directions were delightfully simple… I didn’t have any almond extract, so I added more vanilla. I also used an 8×8 pan, lined with a parchment paper sling. 27 minutes in the oven and a little time cooling later, we cut some small sample pieces. Gavin and Patrick liked the cake, Oliver got sidetracked by the ice-cream. Preheat oven to 325 deg. F. Position rack in the center of the oven.Beat egg whites until foamy. Add the cream of tartar and salt. Beat until soft peaks form. Gradually add the sugar, 1 Tbsp at a time, beating until stiff peaks form. Sprinkle flour over egg white mixture; fold in carefully. Gently fold in flavoring. Pour batter into a 8×8 square baking pan lined unceremoniously with parchment paper (honestly, I’m not sure I’d’ve been able to get it out any other way). 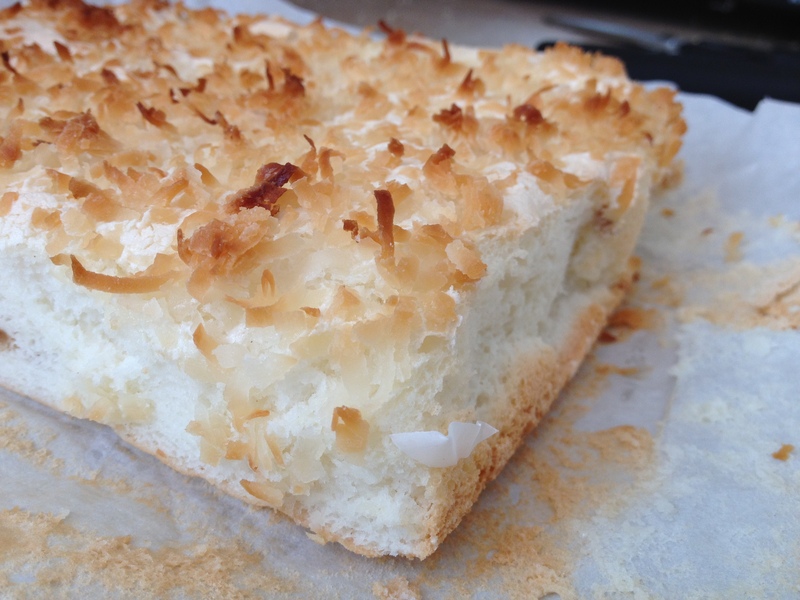 Sprinkle coconut over the top. Bake for 30 minutes, or until a wooden pick inserted in the center comes out clean. Cool in pan about 40 minutes. Remove cake from pan and cut into squares to serve. Couldn’t you just scramble them up for breakfast the next day? Then again, why not make *more* dessert? Hehe.